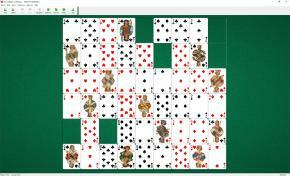 Maze Solitaire uses one deck (52 cards). You have 54 tableau piles arranged in a 6x9 rectangle. Eight cards are dealt to each of the first two rows. Nine cards are dealt to each of the remaining four rows. Aces are discarded. As a result you have a layout of 54 positions with six gaps. 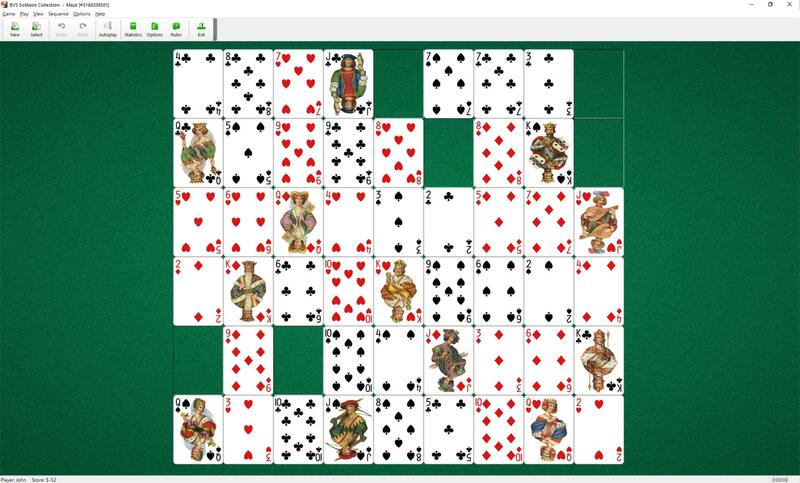 You must consider the layout as a single line of cards reading from top left to bottom right. The top left-hand pile is consecutive with the bottom right-hand pile. To rearrange all cards into four twelve-card suit sequences (each running from 2's to Kings). Each King is followed by the Two of a different suit. It does not matter where the gap occurs. Each gap can be filled with a card that makes a correct ascending suit sequence with the card at the left or at the right of the gap. You can play a Two of a different suit to the right of the King, but you cannot play a King to the left of a Two.